Jay-Z's headline performance at the Glastonbury festival on Saturday has helped boost the rapper's record sales. The rapper's 2004 single 99 Problems is set to go straight into the Top 25 of the UK singles chart this weekend. His Linkin Park duet Numb/Encore, which he closed his Glastonbury set with, is also likely to return to the Top 40. The star has helped Oasis's Wonderwall return to the charts after he mockingly opened his set with the 1995 single, midweek figures also suggest. Jay-Z chose to cover an Oasis track after Noel Gallagher told the BBC that he was "wrong" for the three-day Somerset festival. The original version has experienced a huge sales boost, with the single challenging for a place in the Top 100. What's The Story (Morning Glory), the album it originally appeared on, has seen sales increase of over 200%, while their compilation Stop the Clocks has had a week on week increase of over 140%. A number of other acts which appeared at the weekend festival have benefitted from the huge exposure the event provides. Elbow's Saturday afternoon set on The Other Stage was one of the best received of the weekend. Their current album The Seldom Seen Kid is expected to climb over 40 places back into the Top 20 on Sunday. Friday night's headliners Kings of Leon will see their latest album Because of The Times rise over 40 places, while both their previous albums will return to the Top 75. Other bands to have experienced huge sales increases of their latest albums are The Feeling (78%), The Raconteurs (140%) and Editors (342%). 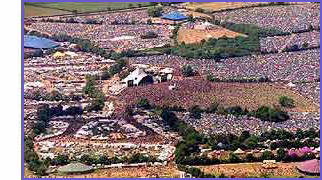 There is also a surge of interest in the songs which provided two of Glastonbury's biggest sing-a-long moments. The Verve's Bitter Sweet Symphony and Neil Diamond's Sweet Caroline are both set to re-enter the Top 75. But Nelson Mandela's 90th birthday concert, which took place on Friday, has failed to have the same effect. There is likely to be no return to the charts for Simple Minds, Annie Lennox or Special AKA's Free Nelson Mandela.